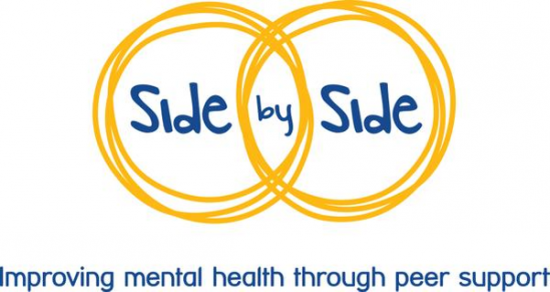 For the last 2 years we have been working as researchers, drawing explicitly on our own lived experiences of mental health difficulties and peer support, as part of the research team’s co-production of the Side by Side evaluation. Between us we have been involved in designing, carrying out and writing up the evaluation, designing and adapting research tools, visiting peer support projects to collect data, and speaking with a wide variety of people involved in many different forms of peer support. The report speaks to the diversity of the peer support made available through Side by Side, and it highlights how important that diversity is. Individuals or groups co-create the peer support solutions that best work for them: people do not simply ‘use’ peer support, in helping each other they are peer support. Peer support is valued by the people who create it – we believe that peer support ‘works’ – it’s good for us because we, the people who create it, make it work both for ourselves and for each other. This is why peer support is not a ‘one size fits all’ solution, but rather support that can be tailored closely to a particular group of people in a particular context. Although this approach may sound risky, as it places power in the hands of people who need peer support, it is not a free for all. In Side by Side great attention was paid to co-creating a safe environment for peer support. This speaks to our experiences as researchers with lived experience of mental health difficulties and of using peer support. Choosing how, when, with and to whom we offer and seek out peer support is an important part of how it’s helpful to us. Collectively we have engaged in multiple forms of peer support at different times and as individuals we can see the value of peer support in the impact we have experienced on our own lives. We have derived great benefit from peer support, but some of us have also experienced negative impacts of the difficulties that can occur in peer support that was not or did not feel ‘safe’. We have drawn on these experiences, and been aware of them and the impact they might have on the research, throughout this project. That people used less peer support over time made sense to us from our own experiences. 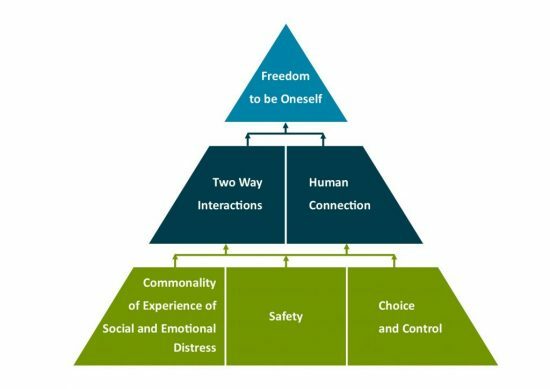 In the core values we identified, freedom to be ourselves was identified as being the top of the values pyramid. At times when we feel we are ‘doing well’ peer support may enable us to feel more like our authentic selves again, and as this happens over time we may need it less, and so use it less. However many people still maintain a core level of peer support as a way of taking care of themselves and others, it is not an all or nothing situation. People use peer support differently to traditional services because we are able to do so – peer support should not be confined to a set number of sessions over a set period of time as would be expected in some forms of clinical support. This finding is an example of how important choice and control is in the peer support community. It is important that people are able to access many different forms of peer support, and that they can access it at different times, for different lengths of time, and in different ways. Some people value being part of a regular group at a regular time, while others will access snippets of peer support through an online platform in ten minute chunks that fit with their family, caring or work responsibilities. Where people are able to try these different approaches, they will eventually settle on peer support that works well for them, and may need or seek out peer support less at times when they feel that their mental health is more manageable. O ur report highlights the importance of other aspects of identity, particularly within BaME communities, that are relevant to peer support. For many of the peers we spoke to, experiences of migration, racism and originating from cultures with different understandings of and approaches to mental health were more important in being able to identify with other people within a peer support project than shared experiences of social and emotional distress. It is unlikely that having mental health difficulties alone would be enough to create the sense of solidarity we encountered within some of the peer support across Side by Side. We each need to have choices about how we define who is a peer to us. This cannot be imposed. We each know which parts of our identities and experiences it is important that others understand so that peer support can work for us. Another example of this was some of us experiencing first hand the positive impact that having more than one facet of a relevant peer identity could have on building rapport during an interview. For example when interviewing someone of the same age, gender and ethnicity, as well as having lived experience of mental health difficulties in common. Other members of our team observed that the specificity of a mental health diagnosis can be important. Not all mental health diagnoses are equally well understood, and misunderstanding and stigma can exist even within peer support. For some people, being with other people who have your specific diagnosis or share a specific experience, rather than being within a more mixed mental health peer support group, can provide respite from those forms of misunderstanding. The final set of core values, derived from many hours of work and discussion of the data, resonate with our own understanding of peer support, both as researchers working in Side by Side, and as people drawing on our own experiences of peer support. The core values pyramid helps us show how interconnected the values of peer support are when put into practice. Like the relationships between peers themselves, no single ‘value’ works in isolation. Because peer support is made of the people that access it, it is able to enable people to feel they can express their true selves, while at the same time also being part of a larger, supportive community. Once again, you do not just ‘use’ peer support as may happen in other traditional services, you also are part of the peer support through helping your fellow peers. What has been particularly striking to us as researchers has been the different ways in which language has been used across the programme by the different people involved. National Mind and commissioners may use different language to us as researchers, including using the terms ‘project’ and ‘services’ for peer support. This felt too close to the language of mainstream mental health services. In turn, when working with the data we as researchers used different terms to those involved in mental health activism. People newly accessing peer support through Side by Side spoke to us about their experiences using a different language again – that of the ordinary and the everyday, with concepts like ‘power’, ‘empowerment’ and ‘democracy’ absent from conversations. As researchers who actively draw on our lived experience in our research work, this is where we were at an advantage over other members of the Side by Side evaluation team. While we are trained in research methods and familiar with research terminology, we are also able to view research materials from the perspective of our mental health and peer support experience, and identify how those materials may be confusing or incoherent in the everyday world of peer support. This is why a co-production approach has been so important in this evaluation. When approaching the work to identify the core values of peer support we were involved in all of the discussions about what should go into the interview schedules, were involved in decisions to change them as the work progressed, conducted the interviews and analysed the resulting data. This meant that we were able to draw on our personal experiences as a source of knowledge throughout the process, and produce work that better reflected the everyday experiences of peers in the Side by Side evaluation. This ability to have ‘a foot in both camps’ is part of the added value of having researchers explicitly working from the perspective of our own experiences of mental health and peer support in the team. In this work we have been able to draw on multiple facets of our identities and use the insight those identities have given us as key moments in the project. This has been effective when working in the Side by Side evaluation team because our colleagues are supportive of this approach and respectful of the experiential knowledge that we bring to the project and topic. This has not been the experience of some of our team in other environments. One of us has previously been involved in research where members of the research team found it difficult to recognise the strength of their research skills, and took an unnecessarily risk adverse approach when doing face to face interviews. In contrast to this the Side by Side evaluation team has provided an environment in which we have felt empowered to develop as researchers. We were equal partners in the research process, and our contributions to discussions and debates over research methodology were considered seriously and often led to changes or innovations in the research process. One of us was able to overcome the barriers that come with a physical disability to do research through working with the Side by Side evaluation team. Another of us was able to learn to challenge their own, internal sense of stigma, and to learn to view their mental health experiences as an asset. We believe that this process of co-production has led to a report in which ordinary people involved in peer support in Side by Side were better able to talk about their experiences in their own voice. We think that this is at least partly because we have used insights from our own lived experiences to build rapport with peers in Side by Side in a way that demonstrates empathy, trust and mutual respect. The participants in this study knew that we as researchers were working alongside them with some understanding of what it is to experience social and emotional distress and to care about developing and using peer support. We very much value what the research participants shared with us and appreciate the time, effort and impact that sharing their experiences of peer support can now have on its future development.